An original idea From Jennifer, this printed alphabet tracing board offers your child wonderful learning opportunities. 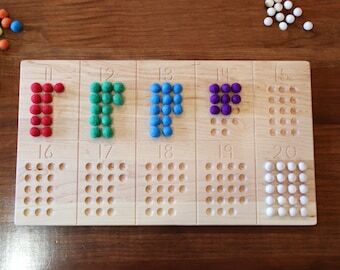 Follow us on Instagram for more ideas on games and ways to use your board. The engraved maple wood has gently curved grooves, providing a form to trace with either your finger or the included tracing stick. We have three versions of this board available from the dropdown menu. 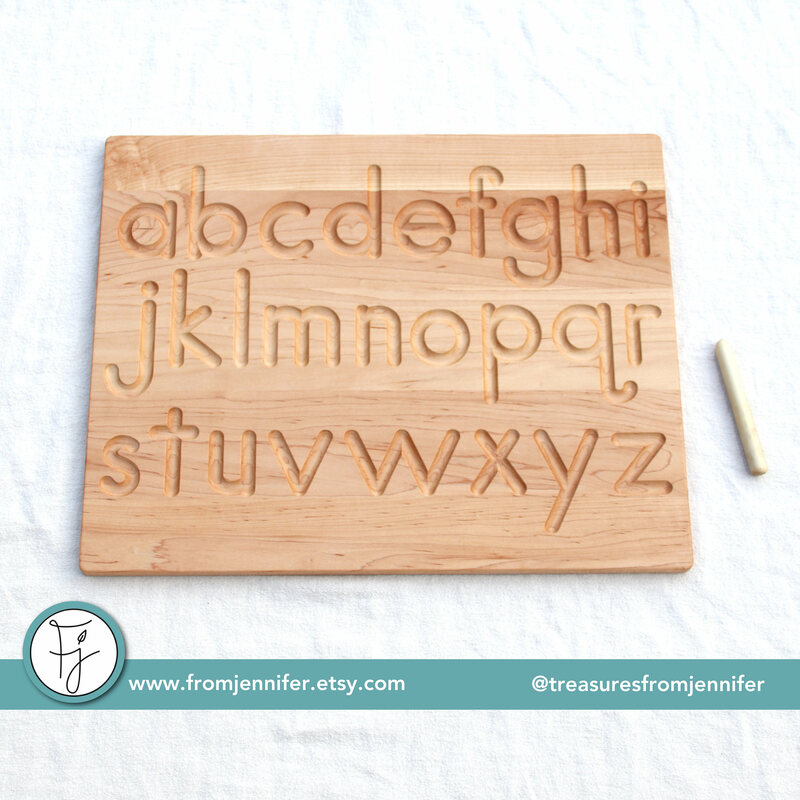 Choose from Lowercase Only, Uppercase Only, or Reversible Lower and Uppercase Alphabets. It measures 17.5x14-inches and is 1/2" thick. Due to its size and weight, shipping runs on the higher side for this product. We always offer the lowest shipping amount for your order, so I just wanted to point this out in case you feel something is amiss. Generally, those closer to the midwest will pay around $12 and farther away towards the coasts can expect to see up to $18 shipping. Your cart will calculate it for your area. If you end up overpaying for shipping (which I find out when we actually ship the package), I'll refund the difference to you. These are made to order and our general turn around time is two to three weeks. Absolutely beautiful! Will order again! Such good quality and perfect for my granddaughter! Jennifer made sure I had it in time for her birthday party! Beautiful work and excellent customer service. Will definitely be ordering from here again! All personal checks must be made payable to From Jennifer, and be received and deposited before I will ship your purchase (please understand that though the process takes longer, I like the surety of a good exchange). If you wish to cancel your order, please contact me as soon as possible. If the order has already been shipped, cancellation can no longer take place. Everything in our shop is made to order and each listing has the turn around time mentioned under the Add to Cart button. Most orders will ship three weeks after they are placed. This is an estimated time frame since we have a fluctuating amount of orders with some weeks much bigger than others. If needed by a specific date, please mention that during the checkout process. For international shipping, please contact us for the most accurate shipping quote for your order. Buyers are responsible for any customs fees or taxes that may be charged.